We’ve been to Cape Town a few times throughout our lives, and we always make sure to make a stop at Karibu Restaurant. Sitting right at the waterfront, they offer a delicious menu with mostly local and proudly South African dishes. 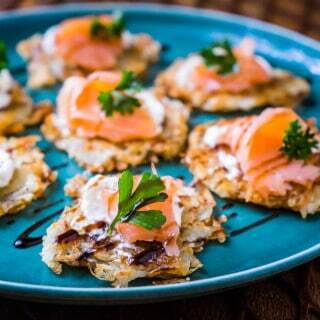 Our favorite starter are these little potato rostis with smoked salmon on top. Not very local or proudly South African (haha), but finger-licking good nonetheless. 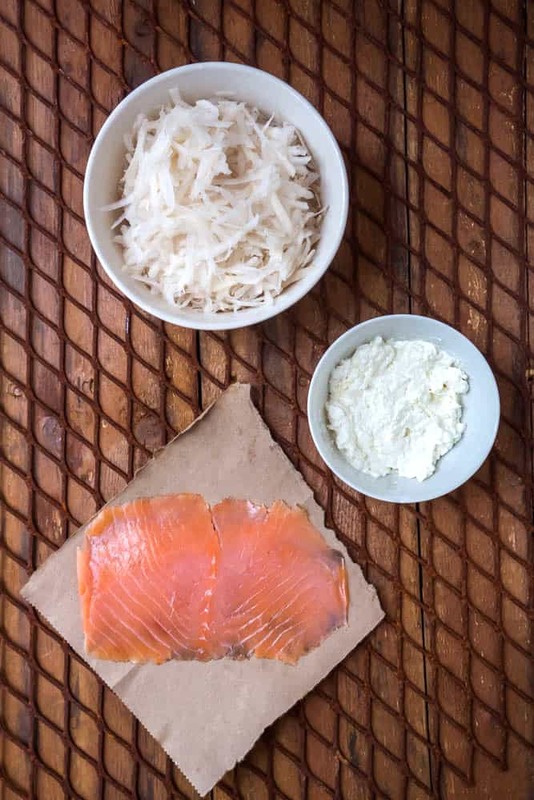 Sometimes the most delicious things are also the simplest, and with only 4 ingredients, it can’t get any simpler than this. I’ve always been a fan of “simple”, especially when it comes to food. Each individual ingredient should shine and their flavors shouldn’t get muddled with any other ingredient. 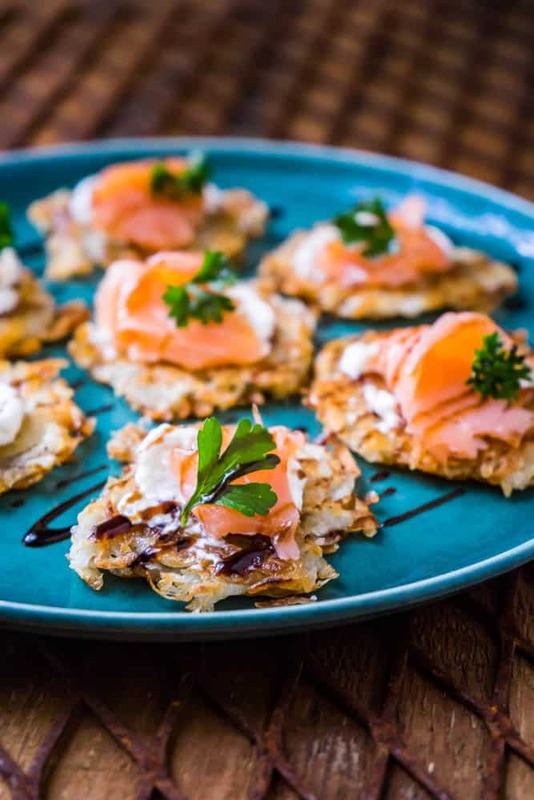 This recipe right here, Smoked Salmon Rosti, is a perfect example of that: potato, cream cheese and smoked salmon with a drizzle of balsamic glaze. Each ingredient is delicious on its own, but even more delicious together with the others, without overpowering them. 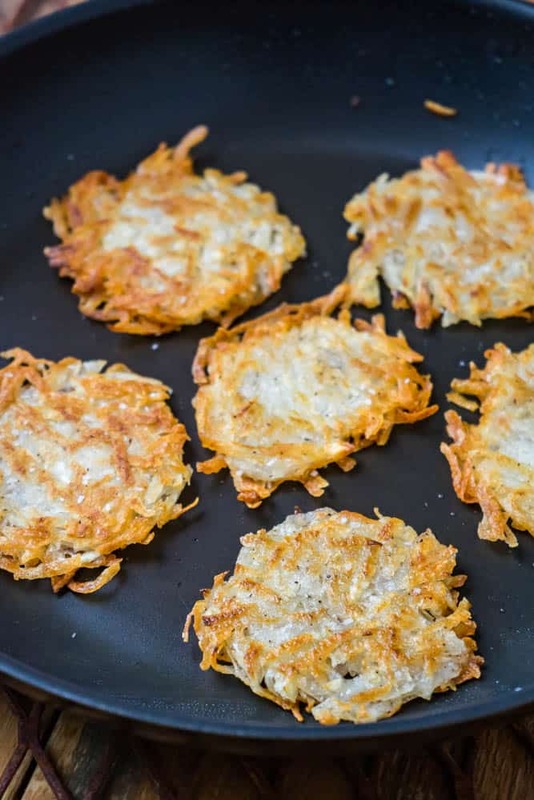 Even though it’s a simple little appetizer, it’s not one of our most time-friendly recipes, thanks to the potato rosti’s. The potato needs to be shredded, then rinsed well to remove the excess starch, before being drained, formed into small rounds and finally seared. It’s all worth it, because they taste amazing. Potato and salmon is without a doubt one of my very favorite flavor combinations. Add some cream cheese and balsamic glaze, and it takes it to the next level. Rinse the shredded potato well until the water runs mostly clear, then drain. Take handfuls of the shredded potato and squeeze to ensure all the water is out. Be sure to work quick, as the potato will brown. Now, form flat 2"/5cm round cakes and cook immediately on a medium hot pan in a thin layer of melted lard. Approximately 2 minutes per side. Transfer to a paper towel when done. Once all the rostis are cooked and cooled. Smear with cream cheese, top with a thin ribbon of smoked salmon and drizzle with balsamic glaze. 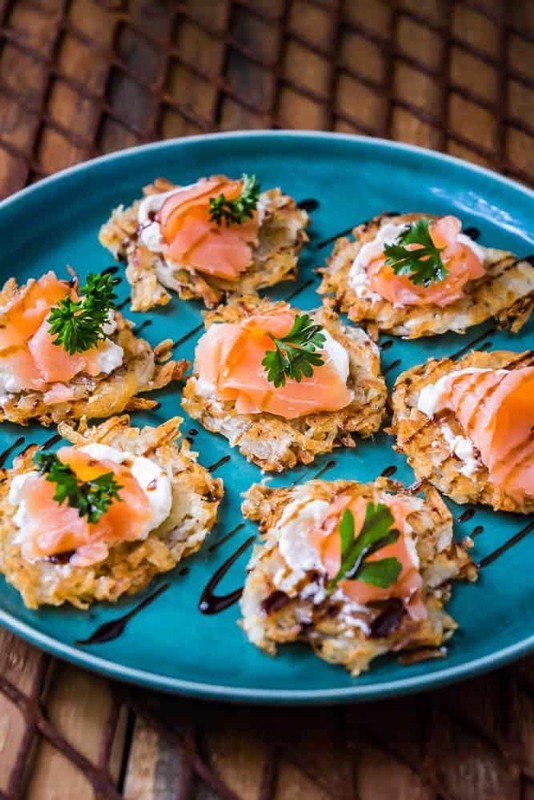 Smoked Salmon Rosti – Pin It!